let me introduce you to the world of the modern drummer frombehind the cymbals. having placed bum on appropriately padded stool, with snare drum between knees, the co-ordination part is added to by the presence of pedals on the floor. assuming the drummer to be, as i am, right-handed, the pedal under the right foot activates the beater connected to the bass drum. the pedal to the left is connected to two cymbals on a stand; the hi-hat. however, in a vain attempt to convince the passing guitarist or stray member of an audience that i have co-ordinational abilities beyond their wildest dreams, i bought myself a double bass drum pedal. this places two beaters on the right foot pedal which operate independently of each other, the left actuated by a pedal sitting to the left of the snare drum stand, and linked by an extendable rod. it is common practice amongst the percussively inclined to nudge the hi-hat stand several centimetres to the left to accommodate this extra pedal. however, as has been successfully pointed out by a professional drummer of my acquaintance, those of us who spend any amount of time in the paradiddle driving seat, spend way more minutes/hours with left foot on the hi-hat than will ever be the case with that left bass drum pedal. in fact, if truth be known, most drummers play the double pedal very rarely during the art of music making, unless a member of some sort of metal band, or perhaps something involving prog rock. his solution and suggestion, therefore, was to place the hi-hat pedal nearest the snare, and move the leftmost bass pedal outboard of this arrangement. this greatly eases the comfort zone by having the left leg in a more ergonomic position during the average gig, and diminishing the effects of the back-ache that ultimately affects most of the drumming fraternity. it's a stunningly obvious notion, but one not even on my horizon until it was pointed out, and certainly not taken notice of when drum companies photograph their catalogues. the same drummer, however, also pointed out that photographers are rarely great drummers, if indeed, they are drummers at all. strokes of genius and the existence of the obvious are almost always seen to be simplicity of thought only in hindsight, and despite many years of bicycle and attendant trinketry development, the stunningly obvious is still being discovered by strokes of genius. if you are as fastidious as i, you will have marked in the diary, or a calendar on the ipod/ipad, the dates on which the bicycle chain ought to be replaced. this fastidiousness, in my case, extends only as far as six months, though in the winter i have a feeling i ought to be a bit previous and change it between three and six months. anyway, it makes very little sense to apply a shiny new ten speed when the ten sprockets at the back resemble a window box, the gaps between sprockets being filled with enough agricultural detritus and oily sludge to qualify for a farming grant (actually, these are always known as schemes for some unknown reason). if i can be bothered, i'll remove the cassette from its splines, apply something approximating degreaser, and polish each with gusto. more likely, however, i'll find that scrap of an old beach towel lying in the corner of the bikeshed, cut/tear a strip off the edge and try to slide it in between each sprocket. 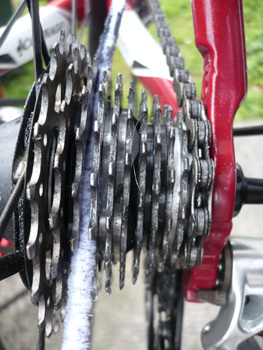 in theory, this method has much to recommend it, but in practice, the teeth rip the poor thing to shreds, and instead of a clean cassette, i end up with a fluffy mess. there has to be a better way. not entirely suprisingly, given the amount of words i've applied to this already, there is, and purple harry's your man. purple harry's bike floss resembles the pipe cleaners of yore; in fact they're damn near identical, apart from some purple flecks and an abrasive quality. 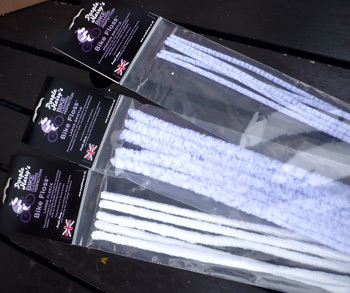 there are three variations of purple harry bike floss: thin, thick and fluffy. the first two comprise the purple-flecked variety, and are abrasive to the touch. 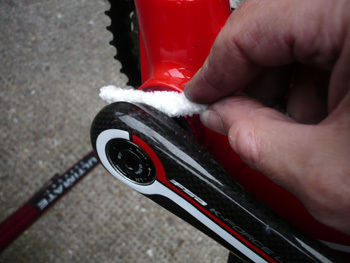 the fluffy one is pristine white and soft enough to be used on carbon without scraping the paint or clearcoat. 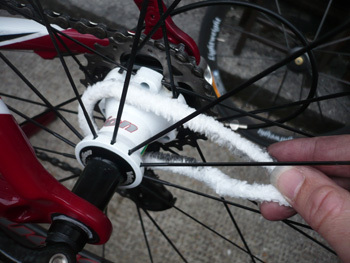 take the narrower version, spray some degreaser on the cassette, and proceed to twist, turn and pull the floss bewteen each pair of sprockets. it works almost too good to be true. and it's so stunningly obvious, that i am left wondering why i didn't think of it years ago. or more to the point, why didn't you? i feel i need not detail every last use to which purple harry's bike floss has been put. it seems only right and proper that i leave the joy of discovery and invention to the rest of you, because if you haven't already rushed out to buy some, then you will only be inches away from doing so. each pack of five flosses retails at £4.50, but each one lasts for several tasks before reaching the bin. as inferred above, several accompanying products are due for release quite soon, including a wash and polish mitt, degreaser, detergent, polish and lubricants. perhaps not so much of a brainstorm, but i figure you only need one great idea to get started. quite superb, but i still wish i'd thought of it.